Dr. Frank Wong, the Bayer CropScience senior regulatory affairs consultant and the 2017 TOCA Environmental Communicator of the Year, shared his insights on Pollinators, Pesticides and Public Perceptions with TOCA members during the 2017 annual meeting. In recent years there has been a lot of discussion about the decline of the bee population worldwide. Wong shared data to shed light on the issue. In most places, bees are not declining as dramatically as once thought, he said. However, as the green industry, we can still take steps to help mitigate the stresses the bee population is facing. 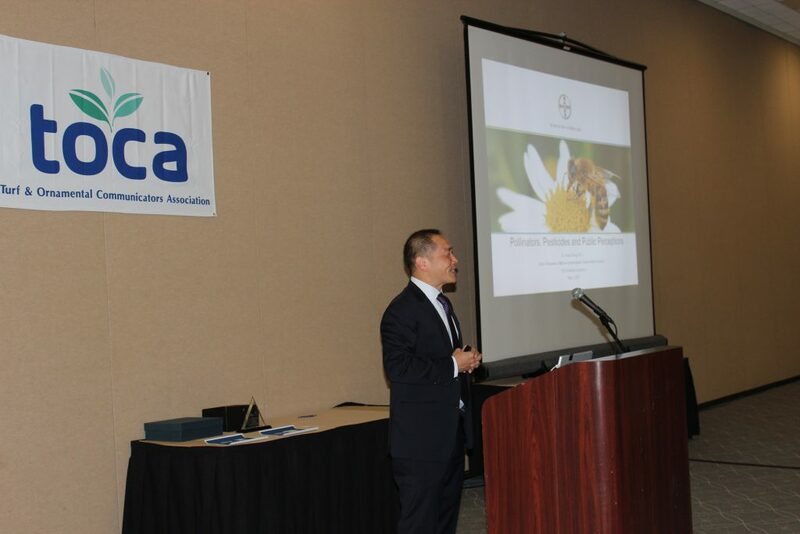 The U.S. GAO report on bee health from March 2016 listed factors affecting pollinator health, and Wong outlined ways to mitigate these stressors. Wong said, by taking these into consideration, we can be part of the solution and prevent potential damage to pollinators in the future. Migratory stress from long-distance transport. Reduce reliance on long-distance transport. Parasites and diseases. Manage hive pests: Varroa mite and others. Pesticide use. Follow label instructions. Use and steward pesticides responsibly. Manage pesticide drift and exposure. Habitat loss: degradation, fragmentation and reduced sites for nesting and breeding. Increase natural habit in agriculture and urban systems. Poor nutrition: decreased forage quality and diversity. Increase forage diversity. Wong also highlighted why organizations like TOCA matter. TOCA members provide public information, education and outreach to many audiences, while upholding journalistic standards and fact checking. This is key for science and issues communication, especially with all the places people can now access information.